In our last post we asked the Sound Transit Board to focus on elevated West Seattle options for ST3. A tunnel would lessen impacts but $700 Million in Seattle transit funding is far better spent on transit expansion. The focus for the ST3 planning process should therefore be to craft the best possible elevated option. The representative alignment on Fauntleroy with a station to the east if the Junction and tail tracks nearly reaching the junction. An elevated alignment that curves through the neighborhood north of Fauntleroy in order to orient the station north/south on 41st. Both options will score high on reliability and, with details done right, high on accessibility. Unfortunately, the first option has a fatal flaw on expandability. Expansion to the south would require crossing California for elevated tracks continuing south on a street to the west. Per Sound Transit, the line would then need to cut back across California at some point to continue south. The property impacts are big enough to make this extremely unlikely. The Junction stop would become the permanent end of the line. The second option orients the station north/south on 41st (good) but instead of being on an arterial, cuts through the neighborhood at an angle which requires the line to impact the most existing housing of all the proposed alignments. Though we prioritize transit and future transit riders above all other concerns – we can understand why people would not be excited about this option. With those things in mind, we’d like to put forth a third, “mix and match,” alignment that addresses the weaknesses of both options. The new elevated option would follow the Fauntleroy alignment to Alaska but take a sharp turn onto 41st. Though sharp turns are generally not ideal, they are part systems worldwide (check out the NYC Subway south of Central Park) and one right next to a station where the train will already be moving slowly will have minimal impacts on operations. We need to think about the future when making an investment of this scale. Looking at the Sound Transit’s HCT study work, an elevated line to the south of The Junction is likely to be a better investment in terms of capital cost per weekday rider than the line to The Junction itself. It would be an entirely separate process, but see C5 (pages 10-11) in the HCT study for a sense of what that extension could be and how it would perform. It is our strong opinion that funding a West Seattle tunnel is both a poor use of transit funding and, to put it bluntly, not going to happen. It’s time to look past that distraction and find an elevated option that works for West Seattle transit riders – both now and in the future. You have until April 2nd to comment on the ST3 level 3 options online. Join us in urging the Sound Transit board to advance an elevated West Seattle option designed for future expansion. Where is the $700M for a tunnel supposed to come from? Herbold sounds like she would raid funding for every other transit project to make it happen. Just… no. I’ve also noticed that no tunnel fans mention the fact a tunnel would take longer. People seem like they want Sound Transit to build this ASAP. I have suggested, somewhat snarkily, that the Council try the head tax option again. To see Big Tech take on West Seattle has a Godzilla v. Mothra feel to it. Not only take longer, but require a large fenced hole during the entire construction period. The tunnel discussion would be different if it was explained that the station hole would be there 8-10 years and wipe out a full block of the neighborhood in addition to costing lots more and adding 4-5 years to construction. I really wish the people making these suggestions would actually visit West Seattle and look at the topography before guessing on a map where they think things should go. Any alignment Fauntleroy is a mistake. The turns are too sharp, and any line extension will turn into a huge fight over bisecting neighborhoods and impact. Way too much effort has been spent worrying about what the WSEA chamber wants at the junction, nucor on avalon and the port crossing harbor island that this extension is already so poorly designed by committee its nearly backwards. No final plan has had a realistic station west of Fauntleroy with a concept of how to get to westwood and white center, they all just dead end at the junction demand a tunnel and pat themselves on the back. We’re aware of the topography. An elevated line is possible there. The station needs to serve the Junction well and be oriented for expansion. Interested to hear if you have ideas about a better alternative though. Any elevated extention beyond the Junction will involve conflict. We think there is a point in the future where the calls of people who want better transit south of the Junction outweigh the concerns of people who are concerned about impacts of an extension. As someone who actually lives in the Junction, if the alignment is going to be elevated, going along Fauntleroy is clearly the best option. Anywhere else is going to require some serious bulldozing. I like Seattle Subway’s proposed alignment. While I think there is no reason to extend beyond the Junction, at least that can be a future option. The tunnel is extremely popular here. It has been marketed as an equal option to the others and residents have been told by Sound Transit not to worry about the price tag in their feedback. So everyone expects a tunnel at this point. Elected officials are going to have to find a way to deliver a tunnel or have some angry constituents–they did it to themselves by promoting tunnel alternatives. Good point. If they move away from Fauntleroy, they will piss off a whole new set of people in West Seattle. This makes the case for a tunnel even stronger. Suddenly you have people saying “wait a second, I don’t want that — it isn’t even what we voted for”. You also have a new round of opponents — people who live along California. These are well to do condo owners — the type of people who used their influence to get West Seattle rail to leapfrog more cost effective projects. If you live, say, here, https://goo.gl/maps/ygqj5YufNvz — with a nice view of the Olympics and Puget Sound — the idea of a train some day running by your window isn’t very appealing. Suddenly you are fighting for the tunnel as well. The representative alignment is flawed in Delridge (it is way too close to the freeway). But the Junction alignment is correct. It is the least disruptive, and the elevated option that is going to upset the fewest. It is much better to focus your expansion fantasies on Delridge, as we all try to avoid spending hundreds of millions on a tunnel that would not improve transit at all. My understanding from the latest SAB meeting is that the Junction station on the representative alignment (the E-W one on Alaska) is not feasible. It doesn’t fit between the larger buildings. So it makes the alternative proposed by Seattle Subway especially attractive. Well that’s just peachy. So, if I understand you right, the original plan was to buy up some of the cheap land between 40th and 41st, off of Alaska. For example, the Bank of America building and parking lot: https://goo.gl/maps/gEBym9mmJpK2. But now, after they’ve bothered to measure the distance between 40th and 41st, it turns out that it won’t work. Neither will taking lanes on Alaska (can’t have that). So the alternative is to buy up the Bank of American land anyway, but only so that the train can turn, and you can put the station north-south on 41st. I suppose that could work, and it may be a reasonable alternative. But talk about burying the lead. You are basically arguing for one of the few practical options available, while Seattle Subway is arguing that this alignment is better because it can be extended. From a political standpoint, I wouldn’t push the latter, only the former. Ross, not to beat a dead horse, but how is “having trains running by” on California any different from “having trains running by” along 15th NW where there are even bigger apartments? Also, if you are thinking “south on Delridge” — not a bad idea, though it splits the frequency — you need to be beating the drum for a properly designed diversion NOW. @Tom — It is about the views. From 15th if you look west, you see other (usually bigger) apartments. From California, you see the Olympics and Puget Sound (as I mentioned) because it is on the edge of a hill. 15th is also extremely wide, and unpleasant (as you yourself have mentioned). It is already busy, while California (while an arterial) is not nearly that busy. OK, fair enough on both counts. Any elevated southern extension out of the Junction would be a mess with property owners fighting every proposal, which is partially why there’s a push to underground it now. I say, forget about that – make the Junction a spur end of the line (via the representative alignment) and plan a future Burien extension along Delridge, which connects with more lower income people and places that will probably allow more future density. The Junction gets its unobtrusive train, complete with fewer bungalow-demolitions/shadows/noise/whatever-scary-city-things, and we have a plan to expand. Exactly. This makes way more sense. The only way that this gets extended is if it is cheap. Extending from the junction — whether elevated or underground — will never be cheap. There are too many issues involving expensive view property and tricky geography. Where exactly would you go, anyway? I’m not asking rhetorically — I’m just wondering where the train would go after leaving the Junction? With Delridge the direction is obvious. They have already studied it (Delridge was one proposal that was initially planned). Sound Transit has it as possible extension (see page 17 of this document: https://www.soundtransit.org/sites/default/files/project-documents/west-seattle-ballard-link-summary-of-previous-plans-studies.pdf). So you are basically saying that Sound Transit will do what, exactly? Extend both? Abandon the Delridge corridor once again, and focus on serving a more expensive corridor first? What’s the likelihood that Delridge will still be lower-income in 10-20 years? Also, Delridge is lower density and has hardly any businesses, not even a supermarket. Compare that to the apartment buildings and businesses all along lower California that more people are going to, including people who don’t live there. @Mike — It depends on how far out you go on Delridge. Neither California nor Delridge is what I would consider high density, but covering Delridge is a lot cheaper. If the goal is to go out to White Center (which has higher density than lower California), then it makes sense to go via Delridge. I’m not saying either will ever happen (since neither is a good value) but if your fantasy is to have a train go all the way to Burien, then Delridge is way more plausible. If it were to make it all the way to Burien, might as well extend it a few more miles to meet up with the spine at Tukwila. Put in some kind of siding at the airport and then you’ve got two northbound options, one west and one east. Totally unrealistic, but it would be pretty nice. The West Seattle study assumed it would be interlined with the Burien-Renton line, so it would meet the spine at TIB on the way. The travel time from Renton to downtown via Burien was around 40 minutes, so competitive with the 101. That may seem surprising, but 55mph grede-separated speed gets you quite a lot. The turns are no sharper than the ones that already exist on Link near Westlake and SODO stations. Link’s elevated sections in Angle Lake and Tukwila cover topography that is more or as challenging as the West Seattle proposal here. Yeah, the turns aren’t the problem. Focusing on an extension that is probably very expensive over one that has already been studied is the problem. If an extension occurs it will be with a split at Delridge. Ross, splitting the line would mean either a forced transfer at Delridge or lowering frequency. It’s not an attractive option at all. If Deleidge was the priority they should have skipped the Junction instead. A split is fine given the relative demand on each side. Of course this reduces the frequency, but this is bound to be a low frequency line. There are several ways in which it could work. The easiest and cheapest is to just run each train every 9 minutes. That means trains from Bellevue, Delridge and the Junction all converge into downtown, thus giving the shared area 3 minute frequency. If ST spends a little bit more money (way less than any extension) they can run the trains every two minutes downtown, which would mean 6 minutes on each line (which is the maximum East Link can handle). Another long term alternative would be to revert to 2022 pairings. That means East Link and South Link trains go to the UW (and beyond). Both West Seattle lines would then go to Ballard, which means they could run every six minutes, while Ballard gets trains every three minutes. From a system demand and headway standpoint that is pretty much ideal. ST was reluctant to run trains from Tacoma to Everett, but if train operations are automated by then (which seems likely) it will be less of an issue. They could also just run every Tacoma train to Lynnwood, and every East Link train to Everett. That would mean that Everett to Lynnwood would be every six minutes (which is more than enough) while the really long runs (Tacoma to Everett) would be eliminated. Yet another possibility would be to somehow have East Link connect to the new tunnel. From a system design standpoint, this makes the most sense. Trips from Bellevue or Redmond to the UW via the train won’t be especially fast. Many will prefer an express bus (especially when they are done with the SR 520 work). But East Side to South Lake Union, Lower Queen Anne or Ballard will always be fastest via a train. So South Link and East Link trains would go to Ballard. Since both are limited to six minute headways, that means three minute frequency on the Ballard line (which is appropriate and affordable). That would mean that the two West Seattle lines would be paired with North Link. If they each ran every six minutes, that would mean three minutes through the core. I’m not saying any of that will happen. I think any extension in West Seattle (regardless of which way the line faces) is highly unlikely. I would give it about a 2% chance. But of the two options, I would say a Delridge split is more likely. More than anything, that is what bothers me about focusing on extensions. It is highly unlikely they will ever happen. But if they do happen, then it won’t necessarily be where anyone assumes they will be. The only obvious extension in our entire system was a split at the U-District (to make Ballard to the UW easier) but that ship has sailed. Less than 10 minute frequency defeats one of the advantages of having a train in the first place. In most cities with subways you show up when you’re ready, and a train comes in 2-5 minutes, or at most 10. That also facilitates transfers because you’re at the mercy of when the bus gets there or leaves, and infrequency can turn a 20-minute trip into a 40-minute trip, which drives people away from transit. Link has so far kept to a 10-minute standard before 10pm, and I don’t want to see that watered down to 15 or 20 minutes. When I see metros like that (MAX, BART, etc), I think they’re substandard and not realizing their potential, and it makes me not want to live in the area. You make sense, Ross. The most likely scenario I think would be to have a second Ballard line (noting that because of MLK, the Green Line frequencies are restricted yet demand easily could be overcrowded through Downtown) be either to West Seattle Junction or Delridge corridor with the Red Line being the other. A final option is to have a three station stub line from Delridge to the end West Seattle Station with an easy cross-platform transfer. Of course, any interlining requires smooth track switching in SODO. This is a giant issue that most people don’t think about. Getting switching right in SIDO is critical for the entire Link operation. I wish it got more emphasis than it does; people think it’s going to be ok but that’s not assured. In most cities with subways you show up when you’re ready, and a train comes in 2-5 minutes, or at most 10. Most cities that have trains coming 2-5 minutes have subway stops that are way more popular than the ones we are building. Sections like Everett to Lynnwood or SeaTac to Tacoma typically have much less frequent trains. But just for the record, the longest time span I proposed was 9 minutes (and that was with minimal effort). How much ST3 revenues are projected to be available for North King? The agency certainly can cover that $700M add-on, and it might be higher priority than other options. Obviously Sound Transit will allocate some of the E. King and Sno. Co. ST3 revenues to North King for projects and services in Seattle. That spending clearly will benefit the businesses and residents of outlying areas who rely on rail service to/from Seattle. Building a tunnel in West Seattle with only ST money means going cheap on Ballard or massively delaying it. Most of Snohomish County’s money is going into the Everett extension. In fact that project pretty much set the size of the rest of ST3. Chris — you are looking at the (very) outdated revenue projections used before the ST3 vote! Those assumed the ST3 taxes would be rolled back in 2036. It’s not widely known, but the board had to extend the ST3 (and ST2, and most of the Sound Move) taxes to sell 30-year bonds. The ST3 tax rates now can’t be reduced for 12 more years! That is many billions of dollars of revenues beyond the estimates you are working with, and ALL of that extra can be bonded against to afford extensions to the Representative Alignments in the short term. I’m right aren’t I? You are working with subarea revenue projections from before the vote! Real estate prices will probably rise faster than tax revenue, so that’s where all the windfall would go. Anyone who has seen an elevated station that is a few years old will regret the blight it produces. An Avalon structure is the welcoming sign to West Seattle. I don’t think so. A tunnel makes more sense such as the one in Beacon Hill. Like the blight of Sky Train in Vancouver? Yeah, Vancouver is a hell hole. That is why property there is so cheap. Give me a break. I was just there over the weekend. The elevated structures were routes ialing commercial areas in wider roads than we have here in Seattle. And yes, they are now a few years older and they are showing a less new shiny thing. There are panhandlers, guys selling knock offs, litters and homeless who are drunks. I go there about every month to visit and has seen those changes. The stanchions are responsible for homeless people? The concrete stanchions in Tukwila and Bellevue are rather large like freeway infrastructure, so ST should do more to soften the visual impact, like painting them a dark color with contrasting stripes. Something for the artists to do. But a tunnel, West Seattle just doesn’t have the population or density to justify tunnels paid by all of North King, and it vigorously opposes upzones. While there are some large mixed-use buildings in the Triangle, the rest of California Avenue has single-family houses just one block away; e.g., in the Admrial District, and Delridge is even farther below its potential. If West Seattle would upzone a larger 2-dimensional area, then I’d feel better about a tunnel. You call this blight: https://goo.gl/maps/H6J4jVpPvUC2. Or maybe this: https://goo.gl/maps/58W61Ym7aB72. Or how about our own version of blight, here: https://goo.gl/maps/FKBgUEXoRz22. Those stanchions haven’t exactly ruined the neighborhood. In terms of width, look at this picture: https://goo.gl/maps/1DxcTSdTHmQ2. Alaska is wider. Fauntleroy is much wider. The main difference between this street (https://goo.gl/maps/QLghvV4114F2) and this one (https://goo.gl/maps/o3Wf28WmF922) is not the width, but the fact that one of the streets has stanchions, and the other one doesn’t. Did Seattle Subway bother with making a cost/benefit analysis of a split at Delridge versus an extension of the other line? The problem with a split line is the DSTT unless you are talking about a 3rd tunnel downtown or a forced transfer at Delridge. A split would reduce the frequency to 20 minutes on each branch if you did it evenly, and they probably wouldn’t do it unevenly. See above (https://seattletransitblog.com/2019/03/26/a-better-elevated-option-in-west-seattle/#comment-819841). It baffles me how folks think we can somehow afford an extension in West Seattle, but we can’t figure out how to get four low demand lines coming from the south to connect to two high demand lines heading to the north. It is like saying you are going to build an electric car with a long range at an affordable price, but you are really worried about the tires. Is there a reason that California and Fauntleroy have been rejected as N/S pathways? I am so pro-transit/anti-car that it hurts, but even I’m having a hard time imagining an elevated light rail line down 41st. The uproar would be enormous, and I can imagine it having a material impact on ST4 prospects. To my knowledge, Link hasn’t been placed on a single-family residential street before (I’m not overly familiar with the Bellevue alignment), so what makes California or Fauntleroy so undesirable that Sound Transit would be willing to do so in this case? Full disclosure: I live on Fauntleroy, so while I wouldn’t be thrilled to have a train zooming past my window, it wouldn’t be any louder than the traffic is now, and the benefits would be enormous. A 41st alignment seems odd at first, but I see it as quite doable although unorthodox. Elevated rail down California between the Alaska and Morgan Junctions would feel very crowded and raise lots of opposition, between the narrowness of the street, street trees, and multi-story buildings at the property line. 41st Av SW could be reconstructed as a narrow neighborhood greenway, with a row of stanchions along the middle or side. Could be similar to the Streetview Ross posted above of Cambie in Vancouver. Appropriately reimburse neighboring homeowners for perception of loss-of-use/noise mitigation, and I don’t see the harm. High-capacity transit is supposed to go down high-density streets, not single-family ones (and not freeways, generally). California Ave seems like the obvious choice. Another extension south from West Seattle won’t be in ST4. Or ST5 if we get that far. Does anybody think this would be Seattle’s next priority? Or the one after that? An extension so low on Seattle’s priority list should play no part in today’s design decision. The debate over station placement should be all about local access, bus integration and impacts to existing/future development. I would agree that an extension south of West Seattle is not going to be a major priority. To justify prioritizing it, it would either require a bulldozed corridor taking hundreds of homes — or a subway to areas that are significantly more dense to the point that existing residents would be priced out of existing homes anyway. There are many wonderful transit vehicles besides light rail vehicles. Streetcars, gondolas, cable-pulled guideways are just a few — in addition to creating really great BRT systems and connections. The “light rail or nothing” mindset is tragically expensive and inefficient. It may be South King’s priority, and that may drive it for “regional transit”. However, South King has been remarkably silent about the Burien-Renton line ever since the studies came out, so it may be having second thoughts about this Burien corridor. Why wouldn’t it be in the next regional expansion? I would expect Junction to Burien to perform pretty well politically. I would expect Junction to Burien to perform pretty well politically. I don’t. Hard to see Seattle embracing it. The north end feels like Ballard to the UW should be next (and should have happened with ST3). The Central Area and First Hill believes it should have something (e. g. Metro 8 subway), since they keep getting left out. You also have Belltown, that somehow just keeps getting left out as well. Which means that it is up to Burien and White Center to push for it. Those areas are fairly small. I suppose White Center could become part of Seattle, but even then, I just don’t see it. Any reasonable analysis will show that other options are way more cost effective on just about any metric. Nor is an elevated line on a street like California a slam dunk politically. Fauntleroy is a very wide, busy street. Even Alaska is very wide. Yet folks are pushing for an underground station for aesthetic reasons. California is a much quieter street with a lot of homes that would lose their views. Meanwhile, you have the issue of getting over there, and getting back (to serve White Center and Burien). That is a lot of homes you are going to go over as well as plenty you would have to destroy. From that aspect, the politics would not be favorable. It was different for Ballard and Interbay, because 15th is so wide and so unpleasant. No one really cares about it. The apartments or condos there are cheap, as there are much quieter, more attractive places to the west. That is not true for an extension south of the Junction which would mean you would have a lot of opposition, along with a lot of people pulling for other projects in other parts of the city. The Apartments and condos are cheap in Ballard????? Maybe compared to any San Francisco neighborhood, but in Seattle proper, particularly North Seattle neighborhoods in general, more on the high side. Might have been cheap in 1999, but definitely not in the present. Dan is correct. It is really unlikely that any West Seattle line will be extended. Even a Delridge split (which I believe is a lot easier, both politically and financially) is unlikely to happen. We can future proof every last inch of the system, but there are some things that just won’t happen. This is one of them. Keep in mind that the cultural, political and demographic trends that drove Sound Transit and ST3 in particular have reversed themselves. It was dubious enough to run a subway system between cities so far away (Link will extend farther from the core than just about any major subway line, including those in New York, Paris and London). But it was assumed that the suburban trends would continue, and we would need a way to get massive numbers of people from the suburbs to the city. Imagine Lynnwood and Federal Way with 300,000 people, many of whom want to get to downtown Seattle. If the same thing happens in Burien, then an extension sounds reasonable. But it won’t. The cultural reasons for suburban flight in Seattle are now a thing of the past (as they are in most cities). People move to the suburbs because they want more space — which by definition means less density. Either that or they move because the can’t afford to live in Seattle. That means that demand is higher in the city, which in turns means that growth is more likely. You can see this in the population numbers. For several years, Seattle added more people than all of the surrounding suburbs combined (which is extraordinary, given the relative size). This in a city that has largely refused to change its antiquated zoning laws, and thus is behind the rest of the country in that regard. The only city that comes close to growing as fast as Seattle is Bellevue (which is the most urban of the surrounding areas). Burien is low density. Most of West Seattle is low density. Other areas in Seattle are high density, and the difference between those two have only grown. Building lines serving those other areas was a better value ten years ago, and now it is an even better value. The plans for expanding Link to Tacoma, Everett, Burien, etc, were based on their populations then, which were lower than now. Growth targets were about managing the population increase and channeling it to urban centers rather than all sprawling into Covington and Maple Valley as it used to do. You may disagree that Tacoma and Everett and West Seattle as they were deserve Link, but the proponents who made it happen think they do. It’s not just about future growth. That’s one of the arguments about Ballard: that it’s not just for new apartments along 15th, but for the existing population that should have gotten high-capacity transit forty years ago. In the suburban case, if we had kept our old railroads and had more frequent commuter trains on them like Metra does, and if cities like Federal Way hadn’t grown where there is no existing train, then the push for Link to all these areas would have been less. Perhaps you forgot that people in West Seattle would love a quick path to the airport from time to time. Yet transit shares to airports are notoriously low, even for big cities with great transit systems. Employment surrounding airports is significant, but like flights, often involve odd hours, where driving is extremely easy, and transit struggles. For example, the first trains arrive at SeaTac at about 5:00 AM, which is a too late for many workers. In contrast, the 574 starts at 2:00 AM, and that is its busiest bus (with other early morning buses close behind). It is simply not cost effective to run a train that early, and even if they did, lots of riders would have a faster trip by bus (let alone by car). The solution is to run a bus, from say, Westwood Village to SeaTac. Oh wait, they already do. It carries less than 500 people a day from there to SeaTac (and that includes Burien). You could split the line, and extend the southern end to the Junction, but it still won’t perform very well as a *bus*, let alone a train line. For me, the question keeps coming back to land use. Bluntly put, is West Seattle willing to upzone ststion areas and accept the construction disruption to have light rail generally? Given the addition cost of a subway line and station, are they willing to go higher as well as introduce heavy restrictions on parking? As is, West Seattle with its current density doesn’t deserve the public investment of a subway line and station. There are other transit technologies and strategies that can be created — and frankly would serve other parts of West Seattle better. The problem here is that the entire premise of serving West Seattle was set in 2008 by a line to study light rail in ST2 so no other reasonable transit technology and route system has ever been seriously considered. I’ve long felt that we should be planning an east-west high frequency, exclusive bus transit path between California and Delridge with both RapidRide lines in addition to other routes on it. It’s the kind of systems planning that would really clarify the best way to design all of the West Seattle Link stations. Think of the frequency: maybe 5 minutes or less all day! Stations could be designed with transfers in mind, minimizing walking! High end landscaping could create an environment for more cafes and a hub with a regional draw! A tram/streetcar could be added for both effect and practicality! East-west transit definitely needs something. The 50 seems like the little engine that could, coping with streets that weren’t designed for it. A general question: Should an alternative be designed to be at-grade, and then roads added on top? That would seem to create a cheaper “subway” than digging would, and provide a clean slate on traffic circulation concepts if a station could be designed without a mezzanine. I’m sure some side streets would need to be dead-ended and some driveways closed, However years of construction is going to result in several years of closures anyway. Plus, that would give developers additional motivation to build something much denser with retail on the second floor street level in addition to parking or retail on the light rail level. A little clarification: Generally follow the Seattle Subway alignment here — but begin elevating Alaska Street at 40th, and end the upper street at Fauntleroy. Fauntleroy would begin its elevation around Genesee Street and end at Edmunds Street. The Fauntleroy end just north of Edmunds would split, with upper traffic rising to the elevated street and surface traffic on the outer edges of the current street and turning east on Alaska Street (like Holgate and Airport Way if that street ended at Holgate). The rail platform may have to be shifted more underneath Alaska Street and the tail tracks on 41st would be at the surface. Connecting streets could be closed. With no traffic, pedestrians could more easily walk across the surface light rail at the station from the north to the south (because traffic would be elevated). I’m sure the extra structure would cost a tad more (elevated car street rather than elevated light rail tracks and station) but it’s markedly cheaper and less disruptive than tunneling for a line and station. Once the elevated roadways are built (of course it would be 2 years of detours), the space underneath would be available to build the tracks and station. Leave it to Ballard Subway to make such a statement. Spend it on us, were special. Huh? They mention expansion to White Center in the post. I hope ST actually looks at this. A tunnel is a pipe dream, and even if it were possible it would be an enormous waste of precious transit funds. But there’s no reason to rock the boat more than is strictly needed to maximize transit access in west seattle. For that there only needs to be a station somewhere walkably close to the junction, pointed in the correct direction for future expansion. How the tunnel option even made it past the first round is beyond my understanding. There will be an interesting political battle if a Ballard tunnel goes forward but a West Seattle tunnel doesn’t. If it’s all funded by third parties, then it will be harder to complain. But I suspect there would be a battle in any case. One point is that West Seattle is getting its stub before Ballard. Maybe that will be enough of “giving West Seattle something” that the tunnel issue will dissipate. Especially if a tunnel means a later opening. I like the proposed idea by Seattle Subway. I think Sound Transit could get creative and design a station that works. Why does the station need to be completely north-south? Could the designer possibly orient the station with more of a southwest-northeast orientation? The area where the station is proposed on Seattle Subway map is currently a B of A building and a surface parking lot. Across the street is another surface parking lot serving a home street bank and a jiffy lube. Seems like it could be possible to purchase these parcels and build a station that straddles the intersection of Alaska and 41st while providing points of entry from both sides of Alaska. The one concern I do have with this option is the expansion puts the line right back into an area of single family residential. Although it appears to the south was part of the new HALA upzone so maybe that could a target for TOD design in an ST4 package. Yeah, you hit it on the head. I think some people commenting here are assuming the area in the walkshed of the station isn’t going to change. Whether or not we put a station and future extensuon there it will. It’s reasonable to think about how the line would proceed. I really doubt the plan would be to continue on 41st very far for a future extension. I would continue it as far down 41st as the budget allows, which at $20 million per mile you could easily get the the Fauntleroy ferry or make it head over towards White Center which would be socially responsible thing to do. The Oakland Airport Connector, a three mile system connecting Coliseum BART with the Oakland Airport is a cable-pulled driverless, light weight shuttle that runs on a track. It terminates at the end of the BART platform and can run continuously because there are no drivers. The aerial tracks are light-weight and light shines through. The train is quiet, with only the whizzing of cables creating noise. The worst thing about it is that is moves no faster than 30 mph rather than Link’s 50 mph — but if that adds just about a minute for each additional mile traveled. The system was built for less than the ADDITIONAL cost of the tunnel to West Seattle Junction. I have often wondered if the solution is to go to somewhere on Delridge with Link, and connect Alaska junction this way. The distance is less than a mile! The cost savings would be in the hundreds of millions! With the use of cable-pulled driverless connectors (essentially sideways elevators), it’s possible to keep the same frequency of the train without splitting the line and creating twice the wait. The cost is so much cheaper that maybe even add connectors to Admiral (even extending to Alki someday) and to High Point area (even extending to Westwood Village someday). The technology is cheap enough and less obstrusive enough that it could even be vey cost-effective in others areas — connecting Old Ballard to 14th/Market, Harborview to Pioneer Square (funicular version), Upper Queen Anne to Seattle Center Link, North Capitol Hill to Link in SLU (funicular version) or Lake City to 130th Link. We’re building these very, long distance light rail lines as the “spine” and they are going to offer coverage for long distances. The next logical step is to figure out what technologies work to build the right “ribs” into the system for that last mile or two. I’m glad someone gets what I’m saying! Given the bristly reception full-blown aerial light rail has, I think a quiet light-weight cable system is really worth considering. It could even stop right at California and Alaska and have a halfway stop at Avalon. I like the cable liner tracks better because West Seattle can get a bit windy for gondolas. Of course it would save tons of money — and leave Delridge corridor generally able to be used as a spine. I like the fairly transparent guideways they used in Oakland. This approach might even be used not just at the Junction, but up First Hill, upper Queen Ann or to connect Kirkland with I-405 BRT station. Thanks for this! Commented for it. What’s the chance Junction people are so adamantly opposed to an elevated structure, but also not willing to put up the money for a tunnel, such that adding a station or two south along Delridge becomes an option, in lieu of the Junction station? Would sure be easier to design a station around bus transfers further south along Delridge…. Perhaps the regional system might even benefit more by bypassing The Junction, and West Seattle could always come in with a grade level streetcar or BRT network that covers the neighborhoods of West Seattle and connects to Link at Delridge. Might even be able to get most or all of it done with that $700M! Versus a tunnel that really adds nothing from a transit perspective. The Delridge option was already rejected after the Level 1 comment period and it’d take a lot to change that calculus, especially because it’s so different from the RA. But maybe ST could do something like the First Hill Streetcar, where it finances the construction of a cheaper system(s) that Seattle will run, putting the savings towards another part of the system. A gondola could actually be pretty nice here, and it might be possible to run it all the way to Alaska Junction instead of downhill from it. This way a southward expansion from Delridge doesn’t require a frequency-reducing branch, even though such an expansion seems unlikely in ST4. In West Seattle, walksheds and bus transfer environments are far more important than expansion potential. 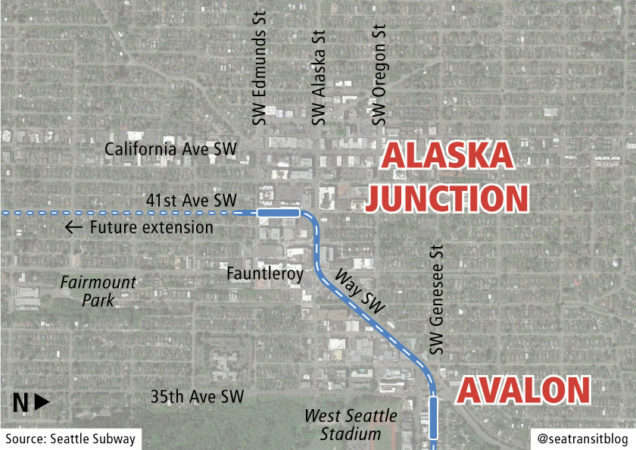 To that end, the Avalon station should bridge over Fauntleroy, and the Alaska station should bridge over Alaska. If we really want to expand south, best to do it with a split at Delridge. We talked more about the value of direct transfers in prior articles. Very much agree that pedestrian experience is extremely important. We would expect most bus transfers from this station to be northbound so if you had to pick a side of the street (not clear that we do – pedestrian acess can be built on both sides) you would pick the south side of Alaska. Claims that we’ve never been there are pretry silly. We have. This is co-written by our West Seattle board member. The line we are sugfesting is mostly based on Sound Transit’s study work. Any cost increases like this tunnel put the timetable to Tacoma and Everett at risk. That’s why I’ve told my ST board members to oppose any tunnel in West Seattle that isn’t paid for by a 3rd party. In this case, the suburban make up of the Board may prevent Seattle from wasting a ton of money on an alternative with no value. This seems like good thinking and a good argument, but wouldn’t it apply even better to 42nd Ave SW, which is one block closer to California Ave.? Do we know of a problem so big up front that it’s worth dismissing 42nd? If so, what is that problem? We selected 41st because ST had an implied bias for 41st with the orange line alignment. Unclear what the pros/cons are but over time we’ve come to know that those selections aren’t arbitrary. The biggest reason they didn’t choose 42nd for the original elevated alignment is because that would’ve required bulldozing newer apartments north of Alaska instead of older single-family homes, so the acquisition costs would have been prohibitive. A tight turn at 42nd and Alaska solves this problem, so Seattle Subway should advocate for that, even if I am unsure about shoving the spine through the Junction. Yes, what Preston said. As I said earlier, I think Seattle Subway is burying the lead here. They are focusing on future expansion, and that really isn’t the primary advantage of turning on 41st. The big advantage is that it may be the only option that is affordable, assuming Joe is right (https://seattletransitblog.com/2019/03/26/a-better-elevated-option-in-west-seattle/#comment-819733). If you can’t put in an east-west elevated station, then turning on 41st is by far the cheapest option, as it involves buying up property that is largely a parking lot (as mentioned in the next comment). It is not great, as it means that folks riding a bus on California will have to walk a couple blocks (or the bus has to waste its time turning, thus mucking up the network), but it may be the only affordable option. If it’s possible to make such a tight turn, why can’t that turn be made as the train exits the station, rather than when it enters? Why are people so obsessed with turning the whole station orientation N-S “for future extension?” Is this entire process even necessary? Check out the tail tracks on the E/W alignment. A turn could happen, but only after crossing California. They could move the whole thing further from the Junction to enable a later turn – but that would hurt utility/ridership. How is running on 44th any worse than running on 41st? Either way you have to work your way over to California (which looks very disruptive). Or do you think a line will continue on 41st, and if so, how far? Ross: I speculate that it would cut back to Fauntleroy relatively quickly. Also – I had a long comment about headways that went away for some reason. I think 9 min headways to Bellevue is the killer for that idea. Splitting the 6 minutes into 12 is far more likely and leads down a parh where it jusr doesn’t make sense. Particularly not judged against C5-ish options, which is really pretty decent. I live on 41st in the potential path of a future southbound train. I will fight this elevated option with everything I can muster. I feel you can end a west seattle line at the junction and find better routes south that won’t destroy a nieghborhood, run over steep topography. If you are talking about part of 41st in easy walking distance to the future station then you are talking about a place that will change a lot regardless of a fiture extension. There is a difference between seeing all your neighbors sell their houses to become apartments, and being told you have to leave. But as it is, I don’t know what exactly would be the future plans. How far down 41st do you think the train will go? In any event, if I was Spott, I wouldn’t worry about it. In his lifetime, he would only see the train turning next to the Bank of America building (on Alaska) and then ending on 41st, between Alaska and Edmunds. At worse he might see some tail tracks on 41st south of Edmunds, but that is about it. I don’t think citing the C5 alignment is a very strong argument in favor of putting the spine through the Junction. The ridership is well lower than the A3 alignment (77K vs 48K), at a very modest savings ($6.1B vs $5.4B). It seems that building the spine down Delridge and through Burien to Renton, with some other connector to the Junction, is more cost-effective overall than running light rail to the Junction and BRT in Burien and Renton. I suppose the study didn’t measure the impact of BRT on Delridge in C5, but I don’t think it’s going to close a 30K gap. We’re just talking about the elevated C5 from the Junctoon to White Center. They didn’t break out the cost for that segment but it would be relatively affordable. Ah I see, that makes sense. Still, if the goal is eventual expansion to Burien and Renton, then I think the study is still working against that. A5 would be the closest to what we’re building, but its ridership is no better than A3 because of the long diversion through Alaska Junction rather than a direct connection via Delridge, and it’s way more expensive. Ultimately, if most of the ridership is going to come south of Junction, then why not build the mainIine to serve those people the best and use a NIMBY-friendly spur to connect the Junction and Triangle to Delridge? Looking at this further, it seems the A3 costs used a movable Duwamish crossing, so a real-world Delridge alignment would be closer to the A5 costs than I thought. Still, it’s not going to be a whole $2.1B closer. A Delridge spur doesn’t really work for operarions reasons. The options are to force a transfer at Delridge station or have unacceptably low frequency on both extensions due to capafiry issues in rhe DSTT. Where the line extends from the Junction, exactly, is TBD but we should build so that the line can eventually be extended. Some really good ideas here but as a junction resident, I would rather not have a light rail installed if it means an ugly elevated bridge protruding through our neighborhood junction. Just save our city time and money and run it on down I5 south. We can all live without it fine. That’s my final answer! i guess it’s time to figure out which neighborhood to give their transit funding to. Anyone have ideas? Yes! Homelessness and drug rehabilitation centers. And another West Seattle Dude says that in the absence of West Seattle funding of a tunnel or any solid right of way public transit options to get people off the peninsula and seamlessly connect to link to get to other areas of the region, e.g., Eastside, North Seattle, Capitol, Hill, without getting stuck in car traffic (in a bus or driving in it) on the bridge, I say build West Seattle link with an ugly elevated bridge. If there is no chance of this being extended south due to how narrow California and 41st are, and if everyone hates the idea of elevated structure, at the Junction, then how about putting it on the surface? That option for Ballard had a few significant advantages, and could work the same here. Given the understandable opposition to the proposed elevated options through even a short section of Avalon/AK Junction, there will NEVER be a future elevated extension going through more neighborhoods towards the south. The Junction will be the end of the line for any elevated line. A tunnel? Perhaps, but certainly no extension for a very long time. In this case, a southward alignment of any elevated option down 41st, 42nd, or any neighborhood street, should not even be considered. The only elevated option that might work (as ugly as it would be) is the Fauntleroy/Alaska alignment. Let’s just make sure it doesn’t extend any further east then AK/42nd or short of the “all walk” heart of the Junction.